*FREE Software Downloads: Creative DRAWings My Stitch Editor Sizer Merge, Wilcom Truesizer Conversion for Home & Industrial Formats , and Floriani Thread Conversion 15 Brands. 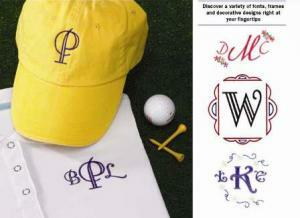 Amazing Designs Monogram It Embroidery Software makes one of a kind monograms. Feature packed the Amazing Designs Monogram It Embroidery Software, stands alone and lets you embroider monograms with a variety of fonts, frames and decorative designs. Handy editing options to rotate, change colors, add embroidery designs and more are included in the Amazing Designs Monogram It Embroidery Software. ©2011 Pulse Microsystems Ltd. All rights reserved. Monogram It! and Amazing Designs are registered trademarks of Tacony Corporation. All rights reserved. Download fun projects, product updates, and more from Amazing Designs!